So we’ve all heard of viral advertising. But what exactly is viral advertising? Viral comes from the word “virus”, and we all know that viruses are very contagious and can spread rapidly. Well, the same goes for viral advertising. It is a technique used by marketers and advertisers to promote or create awareness for their brand/product. The goal of this kind of marketing is to get people to talk about it to everyone and anyone they know. The most common form of viral marketing would be through youtube since its the number 1 video sharing website. Other forms of viral advertising would include flashmob where heaps of people turn up at a particular place at the same time to create a big commotion and quickly disappear after that. That will make people talk about them, spreading the word about that campaign to their friends and families. Here’s a good viral advertising from Hell Pizza. Give it a go! Enjoy! A friend sent me some emails and I thought these ads were really interesting! It really captures the essence of good advertisements which will make us do a double take in todays society where we are all flooded with countless and countless of advertisements day in and day out. 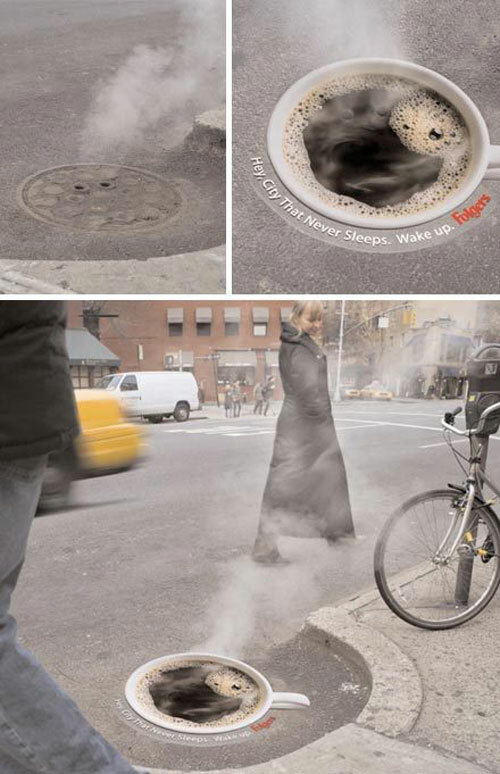 A print of a cup of Folgers coffee placed on top of manhole covers in New York City, USA. Holes on the print allow “steam” to come out making it look like a hot cuppa. Brilliant! 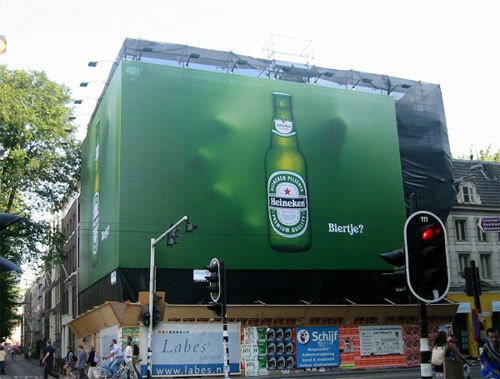 This innovative Heineken ad was on a large billboard in Amsterdam, Netherlands. Life-size stickers of people on an automatic sliding door at a mall in Mumbai, India. 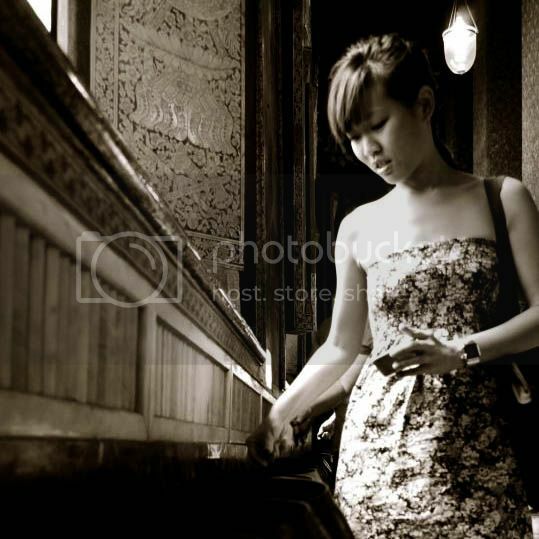 The door moves apart, separating the “crowd” when someone approaches with the message ‘People move away when you have body odor’. 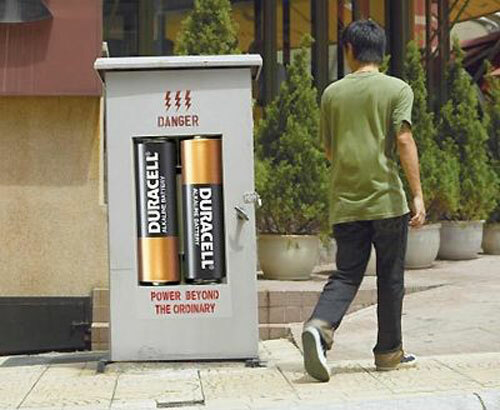 A Duracell Ad in Malaysia placed on a high voltage box conveying the message that Duracell batteries are good enough to be used for even an electrical box. The ‘Caution! Wet Floor’ sign is part of the advertisement to promote Eatalica Burgers in Chennai, India. Copy on the poster reads: ‘Oogling at the burger may involuntarily cause drooling’. Smart. 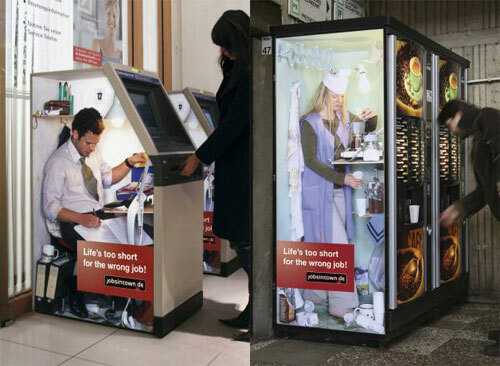 Advertisements for a job-recruit company in Berlin, Germany. 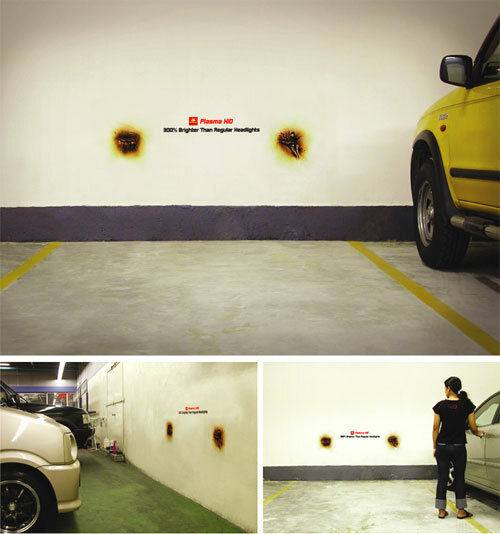 This ad was found in carparks and car workshops in Malaysia where the message it wanted to convey to consumers that its headlights are 300% brighter than regular headlights. The “burn” marks on the wall really does leave an impact doesnt it? 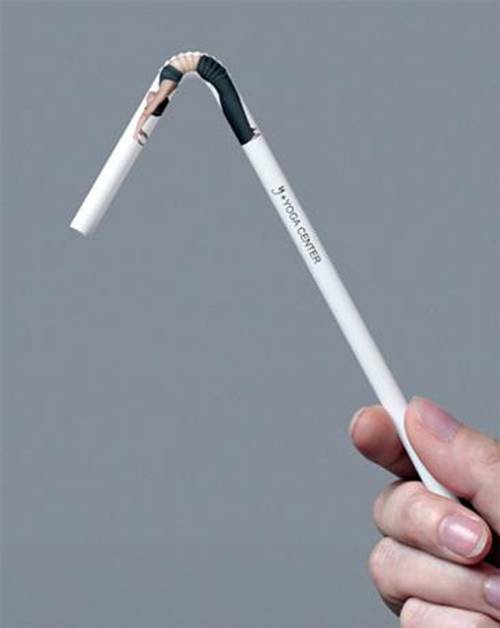 A very creative and cost-effective advertisement in Hong Kong for a yoga school. Enquiries and enrollment went up after this particular promotional stunt. 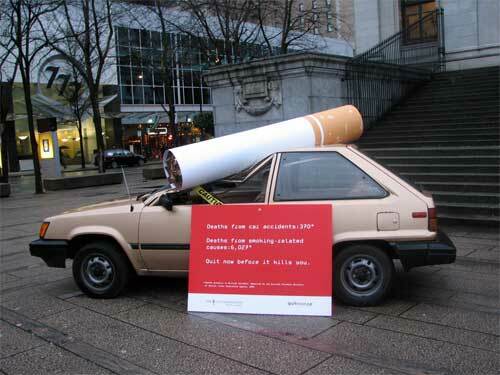 Lastly… We have my favorite advertisment. A smart and creative ad by Mini Cooper in Zurich, Switzerland. 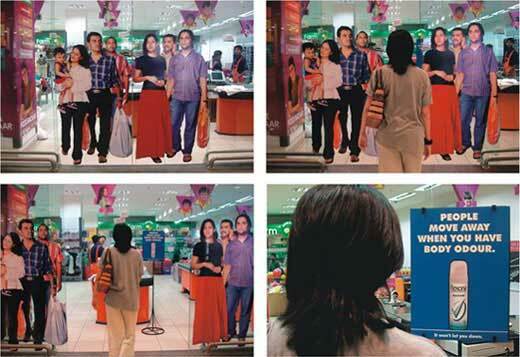 This ad shows people going into or coming out of the car, when in fact, they are actually entering or exiting the train station! Very smart indeed!